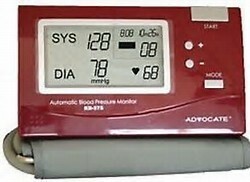 Advocate Automatic Blood Pressure Monitor- Arm cuff 16.5 – 18.9 in. Includes storage case, instruction manual, 4 “AA” batteries. Automatic power off after 3 minutes. 120 times memory for 4 groups. Heart rate, date and time.